The last T20 of the series between South Africa and Pakistan will be hosted by SuperSport Park, Centurion on Wednesday. The hosts have already won the series 2-0 and the last game will be inconsequential in the context of the series. But by no means, it will be a dead rubber as the Proteas would want to inflict a clean sweep while Pakistan would love to go home with a win. 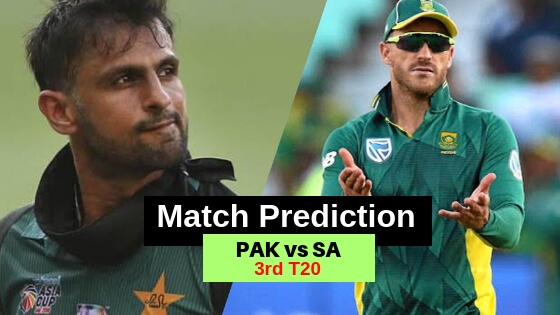 Keep reading to find out South Africa vs Pakistan 3rd T20 Match Prediction. South Africa leads the series 2-0 but much like the ODIs, the scoreline doesn’t suggest the kind of fight Pakistan has put up. They were in winning situations in both the T20s but unfortunately, couldn’t sail past the line. Both the previous games have seen them falling short of Proteas target by small margins. In the last game, it was David Miller again who proved to be the star for the hosts. His 65 off 29 balls propelled the side to 188/3. Chasing the total, Babar Azam scored 90 from 58 and got his side into a great position. But once he got out, the batsmen that followed, crumbled under pressure and Pakistan lost by just 6 runs.